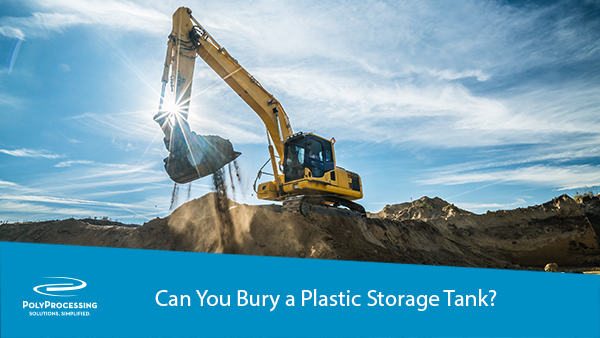 Can You Bury a Plastic Storage Tank? Some companies need to place their chemical storage tanks underground because of space limitations, or for aesthetic reasons. Steel tanks and reinforced tanks are built to withstand the external pressure that is applied underground, but what about lightweight plastic tanks? While plastic storage tanks have many advantages over other tank materials, polyethylene is not the solution for underground storage. Here’s why. Because a tank is a hollow vessel, there’s a buoyancy factor to every tank. That means that a buried chemical storage tank will always want to rise to the surface, even when buried underground. When it rains, the ground becomes saturated and the buoyancy of the tank begins to push upward. The larger the tank, the more buoyancy force is exerted. To counteract buoyancy, you need weight. Steel tanks are heavy enough to handle the buoyancy. But for lightweight polyethylene tanks, the buoyancy force exceeds the weight—especially when the tank isn’t full. In addition, external forces of the ground push against the polyethylene tank. If the tank is less than half full, those pressures will collapse the tank. If you need to place a polyethylene tank underground, one option is to build a concrete vault to take up the weight of the soil. Buoyancy is no longer an issue and the vault protects the integrity of the tank. However, it is a costly solution and you may be better off exploring other solutions. Often, burying a tank isn’t the best option. Maintenance is much more difficult, and leaks can be extremely costly and cause environmental issues that last for decades. If you have flexibility in locating your chemical storage tank and underground storage isn’t essential for your needs, explore the advantages of a crosslinked polyethylene chemical storage tank system. To design a polyethylene chemical storage tank system that fits your needs, contact a Poly Processing tank specialist.